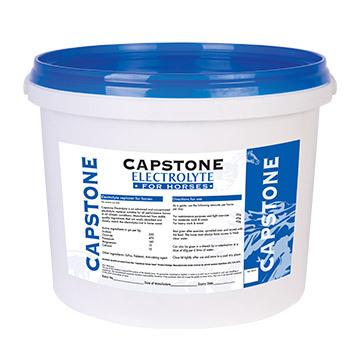 WHAT IS CAPSTONE ELECTROLYTE FEED SUPPLEMENT? Design of this product is based on extensive research and it is manufactured according to strict quality standards. Capstone Electrolyte is a cut above. A horse’s optimum health and peak performance depends on many factors, one of which is feed supplementation. The lack of adequate vitamins, minerals and micro nutrients can be a limiting factor in the horse not achieving his ultimate level of performance as can a deficiency in electrolytes. WHY SHOULD HORSES BE FED ELECTROLYTES? Electrolytes play an important role in muscle and nerve function, metabolism, acid base and fluid balance in the body. Horses at pasture with a light workload usually obtain adequate electrolyte intake from grasses and good quality hay. However, once horses are worked hard and fast, or are exercised for extended periods of time, stabled and put on a high concentrate diet, they usually require an additional supply of electrolytes because these are often deficient in such rations. During exercise or transport, horses sweat to lose heat generated by muscular activity or stress to cool off and as they do, they lose essential electrolytes. The main electrolytes lost in sweat are Chloride (Cl- ), Potassium (K+), Sodium (Na+) with small amounts of Bicarb (HC03-), Magnesium (Mg++), and Calcium (Ca++). Loss of these electrolytes causes fatigue and decreases the thirst response to dehydration. If these electrolytes are not replaced, the consequences can lead to dehydration, muscular weakness, over heating, tiredness and poor performance. Scientific studies indicate that many cases of tying up (equine rhabdomyolysis), a common problem with performance horses, are related to electrolyte imbalances. After receiving proper electrolyte supplementation 70% of cases studied had no recurrence of this condition. Electrolyte supplementation is also important and effective in treating certain types of colic and cases of diarrhoea. Research also indicates that abnormal electrolyte levels in blood plasma adversely affects performance and even small deviations from a narrow spectrum of electrolyte concentration in serum can be associated with poor performance. Electrolytes also help horses rebound from hard work sooner, return to feed quicker and begin the necessary rebuilding phase that occurs after exertion. CHE is a new and advanced electrolyte replacer suitable for all performance horses. CHE is manufactured by NuTec SA (Pty) Ltd from stable ingredients that are well absorbed in the horse’s stomach. Electrolytes are essential to the performance horse and it is critical that electrolyte preparations are properly formulated to meet the horse’s specific needs. CHE provides a blend of electrolytes in a balanced formulation that closely matches those lost in horse sweat. The regular use of CHE is extremely effective in helping to prevent loss of performance due to electrolyte deficiency or imbalance. CHE replenishes the electrolytes that have been lost through sweating during hard workouts, as a result of travel or on hot humid days. CHE contains high levels of Potassium (K+) , a critical electrolyte that is involved in a wide range of body functions, most importantly neuromuscular activity. As natural grass eaters, horses have evolved ingesting large amounts of potassium, the level of which is high in grasses and hay. When a horse is in full training and on a high grain diet that is low in Potassium, K+ deficiencies are likely to develop. Regular use of CHE ensures this does not occur. CHE contains a buffer that reduces lactic acid build up and prevents acidosis from developing. CHE contains Magnesium and Calcium salts in highly bio available forms. CHE contains a prebiotic, which is a substance (short chain fructo-oligosaccharides) made from natural ingredients obtained from sugar beet. Prebiotics encourage the growth of a healthy gut micro flora that enhance proper digestion, resulting in beneficial effects in the horse’s health, welfare and performance. ScFos is made up of 1 sucrose molecule bound to 2,3 or 4 fructose molecules that are metabolised slowly in the horse’s digestive system. Unlike glucose, it does not lead to blood sugar and insulin imbalances and body metabolism disturbances. The inclusion of ScFos in CHE enhances the absorption of electrolytes in the horse’s digestive system due to a fructo-ionic transport uptake mechanism and together with the addition of a specific flavourant enhances the palatability of CHE. It is naturally selective and unique to CHE. CHE does not contain any Bicarb (HC03-) and does not contravene Jockey Club Rules for prohibited substances. Scientific studies have shown that body salt losses are influenced by type, speed, intensity, duration of exercise, climatic conditions and relative sweat output. Percentage electrolyte losses in sweat are indicated in Table 1 for horses in moderate to hard work and reflect the results of these studies. A horse sweating heavily can lose 5-10 litres of sweat in a day whereas horses in endurance rides have been known to lose in excess of 20 litres of sweat in one day. After the cross country phase of three day eventing, it is not uncommon for horses to lose 18kgs of fluids (actually measured at the last Olympic Games). As 1 litre of sweat contains approximately 14g of electrolytes, it is evident that electrolyte replacement is essential and it is important to have some idea of the magnitude of electrolyte loss in order to implement an adequate replenishment program. Before using an electrolyte preparation, users are advised to evaluate the product and to ensure that useful amounts of the critical electrolytes are being supplied. CHE contains more electrolytes for each recommended dose than most other commercially available electrolyte brands (see Table 1 below). CHE is therefore more effective in replacing electrolyte losses caused by sweating and is also cost efficient. Table 2 shows the percentage of electrolytes in sweat, compared with CHE and other readily available electrolyte products. CHE is available in powder form packaged in 2.5kg, 5kg & 20kg plastic tubs. To be stored in a cool dry place. CHE is a quality product from the Capstone Horse Feed product range.